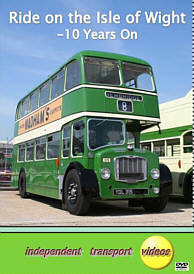 2008 marks the 10th anniversary of our first video programme featuring the Isle of Wight Bus and Coach Museum. This top selling programme, ‘Ride on the Isle of Wight’ is still available today and we thought it would be nice to celebrate this. We therefore returned with our cameras to the island in May 2008 to film the Island Bus Running Day. We start at Newport Quay the current home of the museum and inspect the vehicles and film more arriving. We a take a test ride on Bristol FLF 611 (CDL 479C). After more time on the Quay we travel to Godshill on board Bristol VR 628 (SDL 638J) and return on Bristol FS 570 (YDL 315). A ride to Havenstreet, home of the Isle of Wight Steam Railway is provided by open top Bristol RE 864 (TDL 564K) better known as ‘Shanklin’s Pony’. Returning to the Quay on sister Bristol RE 863 (TDL563K). There is a further ride on VR 628 to Newport bus station and back. As you would expect there is plenty of action, and most, if not all vehicles are featured. On the second part of this programme we go back to 2004 and visit Johnson Bros. (Tours) in Hodthorpe. Here our cameras join a test drive of ex. Southern Vectis (originally Scottish Omnibuses) 621 (OSF 307G) and 620 (OSF 305G), with a view to bringing one of them back south for preservation. 621 (OSF 307G) was chosen, and we follow her back from Hodthorpe to Surrey. An interesting journey as you will see. Finally we return to the island and the 2007 Annual Museum Running Day to see 621 (OSF 307G) externally fully restored to the Southern Vectis livery of leaf green with white band, worn during the NBC era. We ride on her to Godshill and back. So take your seats and sit back and enjoy your Ride on the Isle of Wight – 10 Years On.